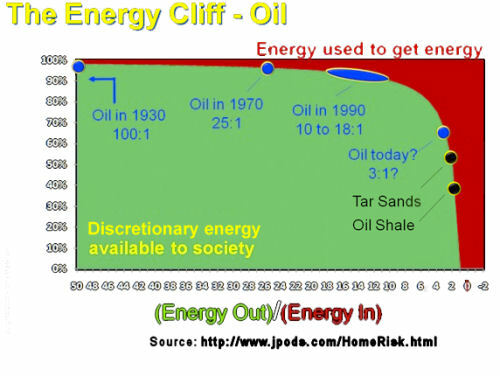 According to a little noticed report in 2009 by the respected (US) Energy Information Administration, the supply of the world's most essential energy source is going off a cliff. Not in the distant future, but within two years. It says Production of all liquid fuels, including oil, will drop within 20 years to half what it is today, when energy demand is rising rapidly. And the difference needs to be made up with "unidentified projects". If the EIA is right – and it has been endorsed by the US joint military command, we stand on the edge of a precipice, with no prior warning from either the industry or governments, which ostensibly protect the public interest. A huge problem is nearly all alternative energy sources are poor energy performers because they need a high-energy input to provide a given energy return. Already there is a crisis in ‘business as usual’ capitalism, with little sign of recovery, warns Robert Peston in his December 11 BBC programme, ‘The Party’s Over’. Many world leaders are spending billions they haven’t got in a panic “to restore growth,” whatever it takes, in a world of rapidly depleting resources. Maybe we should be welcoming this warning for the endless "growth is good" mindset that will devour our planet. Do we plan for a secure and better life or do we carry on blindly toward a minefield of lethal limits? The perpetual growth myth knows no ecological bounds. Damage to ‘the environment’ is considered to be a mere externality. Resource shortages can be relieved just through expanding trade and technology will find a substitute for any depleting resource. Perpetual growthists regard any critics as imposing a dangerous drag on the world’s growth-based pursuit of progress. The crisis has revealed the fragile interdependence of the globalised economy, where many countries can be involved in the supply chain to produce a component manufactured in one of them. In a few years, the markets will face another major trauma when they realise that once plentiful oil supplies are running down rapidly and the 'globalised' economy this has supported will have to rethink completely. A clear opportunity now exists to transform our economy and our society for the better. The current global recession should be an opportunity to forge a new economic system able to avoid the shocks and negative impacts associated with our reliance on endless growth. Where is the strategic thinking to build a dynamic, steady state economy in a sustainable environment? The UK-based New Economics Foundation publishes a "Happy Planet Index," which shows that it is possible for a nation to have a strong sense of well-being with a lower consumption and ecological footprint. If prosperity depended on growing populations to feed economic growth, the Philippines and many countries in Africa would be rich, not poor. According to the World Bank, the top ten wealthiest countries, as measured by per capita GDP, were, in order of wealth: 1. Luxembourg: 491,000 people. 2. Norway: 4.8 million people. 3. Singapore: 4.8 million people 4. USA: 306 million people 5. Ireland: 4.5 million people 6. Switzerland: 7.7 million people 7. Austria: 8.3 million people 8. Netherlands: 16 million 9. Iceland: 319,000 people 10. Sweden: 9.1 million. Many countries have small populations and are quite prosperous and successful - New Zealand and Botswana are examples. Of the ten countries listed, all but one, the United States, have small total populations and The United States, with runaway population growth in the past two decades, has not been doing well of late. Japan is often seen as a forerunner of all that is doomed in the economies of the euro zone and the United States because of its ‘ageing population’ and what is seen as a static economy. But look at Japan's economic performance over the past ten years and "the second lost decade", if not the first, is a misnomer. More than half its population is over 45, but most Japanese have grown richer. In part, because its population has shrunk whereas America's population has increased rapidly. In aggregate, Japan's economy grew at half the pace of America's between 2001 and 2010. Yet if judged by growth in GDP wealth per person over the same period, then Japan has outperformed America and the euro zone. Most cities operate on the assumption that growth is inherently beneficial and that more and faster growth will benefit local residents economically. The report examined the 100 largest metro areas, representing 66% of the total U.S. population, finding those that did best have the lowest growth rates. - Faster growth rates are associated with lower incomes, greater income declines, and higher poverty rates. - The 25 slowest-growing metro areas outperformed the 25 fastest growing in every category and averaged $8,455 more in per capita personal income in 2009. - The policy of pursuing growth is enormously expensive, costing local taxpayers more than a hundred billion dollars every year for the new infrastructure alone. Australia’s GDP per person for the December 2008 quarter fell in every state – linked to population growth, says Dr John Coulter, former President of Sustainable Population Australia. Tasmania, with the lowest population growth, showed only a 0.1% fall per capita. Western Australia, with the highest rate of population growth, showed the second largest fall in per capita GDP at almost 2%. South Australia with a high rate of population growth relative to the economy had the largest decline in per capita GDP at 2.5%. For centuries, before the industrial revolution humans have lived in a relatively steady state economy. There was virtually no interest in economic growth as a policy objective anywhere before 1950. Yet, by the 1960’s, rapid economic growth had bubbled to the top as the overriding objective of policy to remedy all the ailments of western economies. In 2010 the United States population reached 308 million and is (conservatively) predicted to grow to 430 million in the next 40 years – an increase of 122 million people. Taking a (modest) average household size of 4 people and a modest 1.5 jobs per household, this means an extra 95,000 jobs need to be created every month for the next 40 years just to meet minimum demand for new jobs. US unemployment is currently around 9% (officially) and unofficially significantly higher. Globally - present population around 7 billion, at a conservative estimate population in 2050 will be 9.3 billion - increase 2.3 billion, Assume five people in family unit instead of the four in the US calculation, and assume only one job per family unit. Based on those estimates we need to provide over one million new jobs per month for the next 480 months. Can we really meet such relentless demand in a world of diminishing resources? The world’s largest economy created 64,000 private sector jobs in September 2010 and lost 95,000 jobs overall. (US Labor Department). Over the last decade net job creation in the United States was zero. UK data extrapolated from Summary of National Labour Force Survey Data Table 1. - securing imperilled water pumping and sewage plants, dependent on fossil fuel energy to work. There will be few oil-burning ships transporting grain and other goods to the billions now dependent on them, or oil-burning airlines serving the world's major cities and the vital global tourist economy. Yet in September 2011 the Airbus Company predicted that the global passenger plane fleet will more than double by 2030. They are in dreamland. - cutting production of gas-guzzling performance vehicles. Every local and national authority needs to start now to address these challenges seriously and examine services considered most vulnerable to long-term reduction in available fuel supplies. Still we carry on with our head in the sands, wasting resources on an epic scale. There has been little forewarning and planning. Our children won’t thank us for inheriting a world taken to an abyss. We have an overpopulation problem and in the face of that problem deniers and ‘business as usual’ enthusiasts often say cavalierly, “Have the courage to do nothing.” That ideas of this kind are ever associated with word courage is the height of dishonesty and duplicity. Such expressions are also the most profound examples of self-serving thought and individual cowardice I can imagine. That such a point of view is broadcast by the mainstream media is a sign to us of its wrongheadedness.